There is only very little known about this manufacturer, most probably because the business only existed for a very a short time. 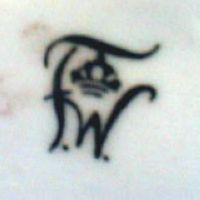 Friedrich Wilhelm Wessel founded the factory in 1949 and mainly produced lace figurines and porcelain household utilities. Nearly right from the start he got into constant trouble for the misuse of the 'Dresden' designation (e.g. Dresden Art, Dresdner Art, etc.) which he was not allowed to use as his items were not decorated in Dresden, in any Dreden decoration style, nor were they decorated by workers that had learned the trade in a Dresden decoration studio. 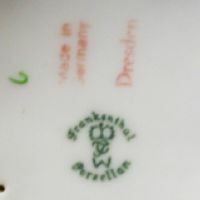 In addition Wessel also used a slightly modified but nonetheless unauthorized copy of an older Frankenthal mark which further increased his problems. The only sure thing is that he was not related with the well known Wessel family from Bonn (Northrhine-Westphalia). 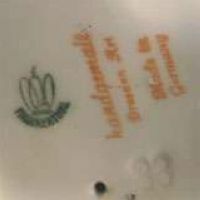 Used between 1949 and 1964. 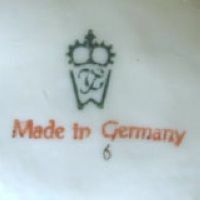 Used between 1949 and 1964, here with 'MADE IN GERMANY'. 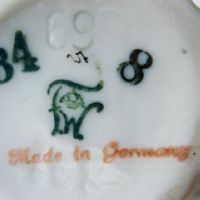 Used between 1949 and 1964, here with 'MADE IN GERMANY' and ⇒HANDGEMALT. 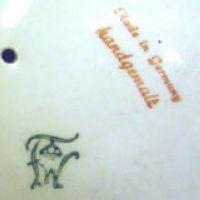 Used between 1949 and 1964, here with the additions 'MADE IN GERMANY' and 'HANDGEMALT'..
Used between 1949 and 1964, here with the additions 'MADE IN GERMANY' over 'HANDGEMALT' as well as 'DRESDEN ART'..
Used between 1950 and 1957. 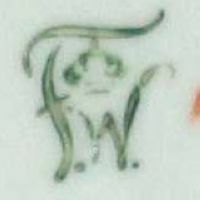 Unauthorised 'remake' of one of the old Frankenthal marks; only addition is the 'W'. Used between 1950 and 1957. 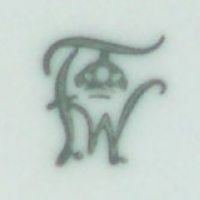 Same as before but with smaller 'W' and additional 'FRANKENTHAL'; can also be found in red. 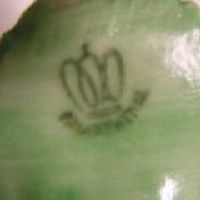 Used between 1950 and 1957. 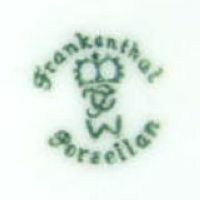 Here with 'FRANKENTHAL' and 'PORZELLAN' additions; can also be found in red. 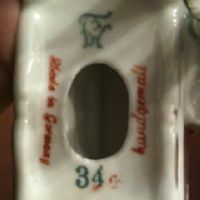 Used between 1950 and 1957. Here with 'FRANKENTHAL' and 'PORZELLAN' plus red 'DRESDEN' additions. 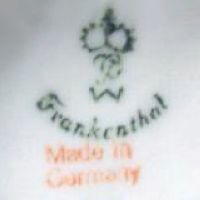 Used between 1951 and 1964, a stylized crown over 'FRANKENTHAL'. 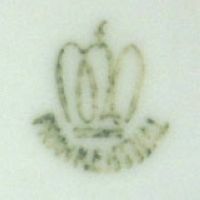 Used between 1951 and 1964, a stylized crown over 'FRANKENTHAL' and a good example of how unreadable most marks were. 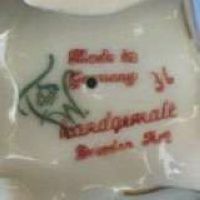 Used between 1951 and 1964, 'HANDGEMALT', 'DRESDEN ART' and offset 'MADE IN GERMANY'. 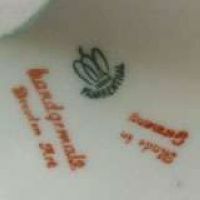 Used between 1951 and 1964, 'HANDGEMALT', 'DRESDEN ART' and 'MADE IN GERMANY'.